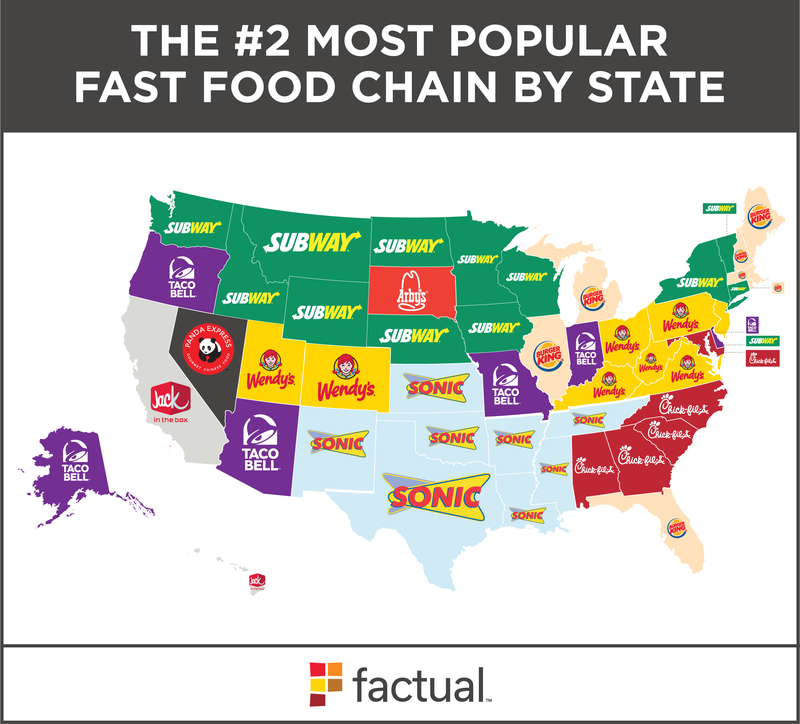 Yesterday, Business Insider and Foursquare published a map of the most popular fast food chains in every state in the U.S. 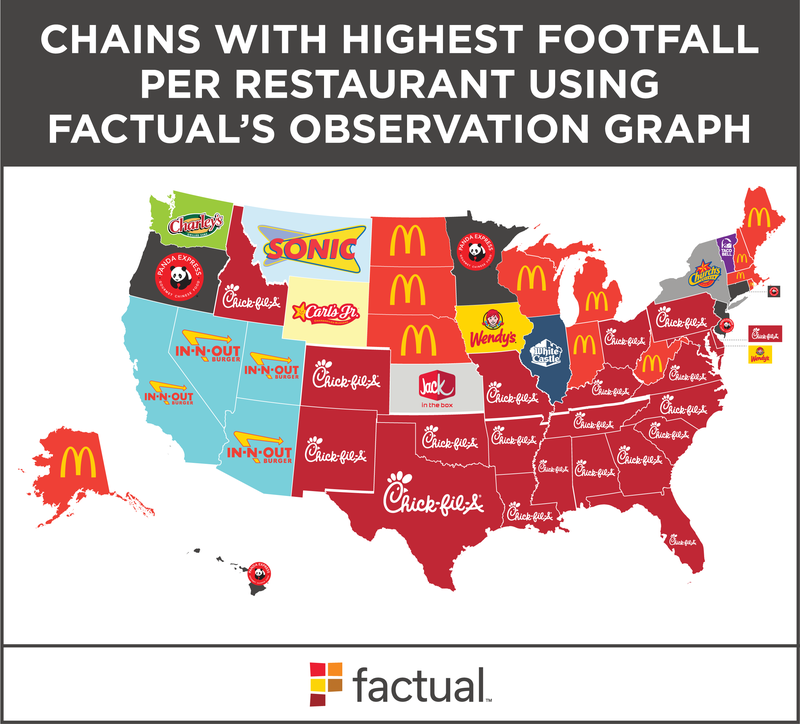 Though Foursquare’s methodology looked at the most popular chains per location, the chains were presented as the most popular overall, with Chick-Fil-A identified as top in 39 out of 50 states. I think I speak for most of Twitter when I say I had these two reactions: 1) That’s a lot of Chick-Fil-A. 2) This map looks… off. It seems obvious, but the “most popular” restaurant chain is the one that the most people have visited, and this map isn’t representative of chains with the highest total footfall. There are only two Chick-Fil-A’s in Oregon. By comparison, there are more than 150 McDonald’s. From the place counts alone, it’s highly unlikely that more people in Oregon go to Chick-Fil-A than McDonald’s. So, what fast food chain actually gets the most visits? Using Factual’s Observation Graph data, looking at visits per month, it was easy to discover the result. It will not shock you. 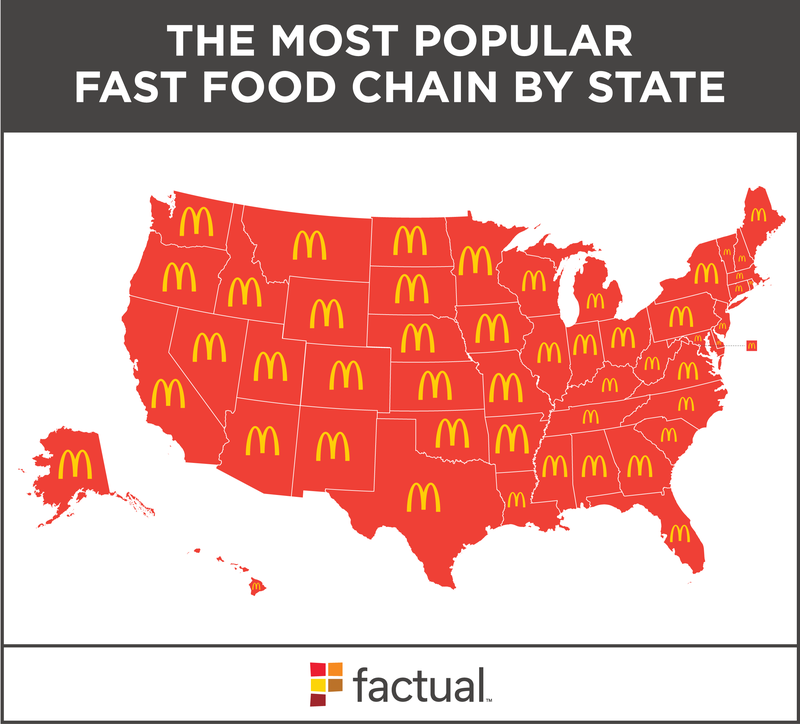 A metric like that will clearly favor restaurants that cherry-pick locations, which could explain why Oregon’s two Chick-Fil-A’s are more “popular” than its 150+ McDonald’s on Foursquare’s map, even though it’s clear that more people go to McDonald’s overall. We found that McDonald’s is the most popular chain by total footfall in every state, but it only has the highest footfall per restaurant in two states and Washington DC on Foursquare’s map. That number seems low. In-N-Out is massively popular in California, but was beaten out by Raising Cane’s, a chicken place with less than 10 locations in the entire state. There are a number of smaller, local chains on the Foursquare map. This could indicate a bias in Foursquare’s data, which relies in part on user-generated check-ins. People may be less likely to check-in at a national chain like Subway or Burger King, since it’s not as interesting to share as a more local or regional chain like Taco Bueno or Culver’s. In my personal experience, the most foot traffic at a fast food restaurant I see regularly is at Panda Express around lunch, yet it’s nowhere on the Foursquare map. The head-scratchers from Foursquare’s original map are gone. 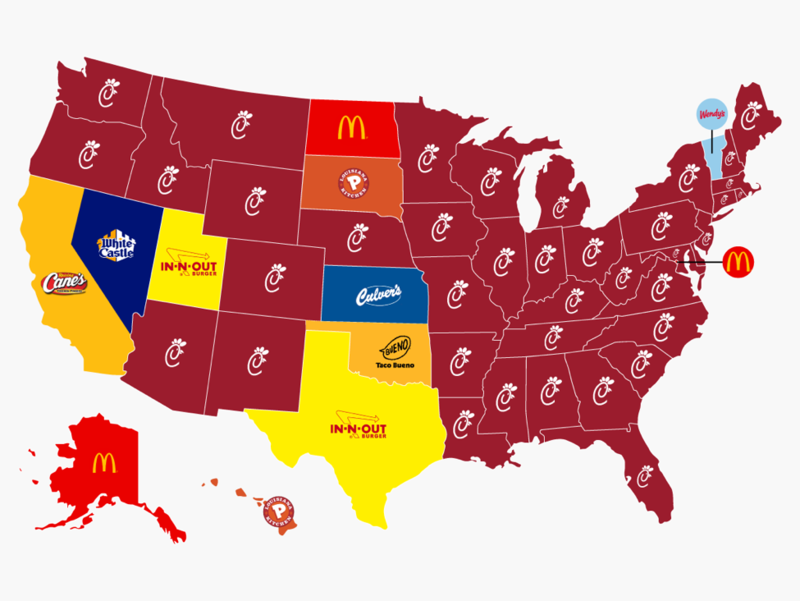 A surprising result on our map shows Church’s Chicken as the most popular chain in New York. This is because their one location in the state is a popular location in Manhattan, which boosts its rank on a footfall-per-store basis. Overall, the most popular chains by footfall per location are large, and exist in continuous blocks. This points to a greater degree of accuracy in Factual’s Global Places dataset, as well as for increased comprehensiveness of its footfall data. At the intersection of marketing and tech, actionable insights arise by combining accurate data with correct methodology. Footfall analysis is only as good as the data it’s built on. Factual’s Global Places™ data is comprised of over 130 million local business listings and points of interests in 52 countries and is updated in real time. In 2016 alone, we added 35.43MM new businesses or places and removed 13.17MM places no longer in operation. Factual’s Observation Graph technology combines location data and mobile device signals to index the real-world behavior of mobile users. Observation Graph generates tens of billions of discrete observations per day on a global basis that include place visitation, event attendance, activity detection and more, providing a comprehensive understanding of real world audiences. In the last 30 days alone Factual has processed more than 91 billion validated observations globally. To learn more about Factual’s Observation Graph, contact our team.